Viviscal Man contains the exclusive AminoMar C marine complex that provides the essential proteins needed to nourish thinning hair and support natural hair growth. Amino acids are the basic structural building units of proteins and are essential in the formation of the hair structure. With Viviscal you can enjoy the feeling of better hair. Backed by over 20 years of scientific research, Viviscal Man dietary supplements contain the exclusive marine complex AminoMar® – a rich compound of marine extracts. Plus Zinc, Vitamin C, Horsetail Extract and Flax Seed, to nourish hair from within. 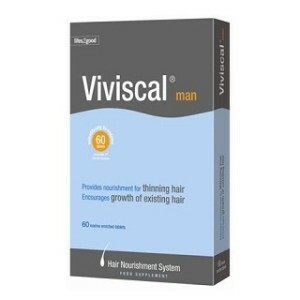 Viviscal is a hair thinning loss supplement which contains a scientifically proven formula. It is made from 100% natural ingredients with 22% protein. As with all hair loss products you will not see instant results overnight. Most treatments need a few months a least before any difference is shown. Even then not all treatments will work for everyone. Some people may see great results while others will see no results at all, there is no guarantee that the product can or will work for anybody. The product is readily available in stores and online. In addition to the treatments, Viviscal has developed a scalp lotion, a conditioner, and Viviscal shampoo so a complete hair programme is available to enable you to maximize the treatment.